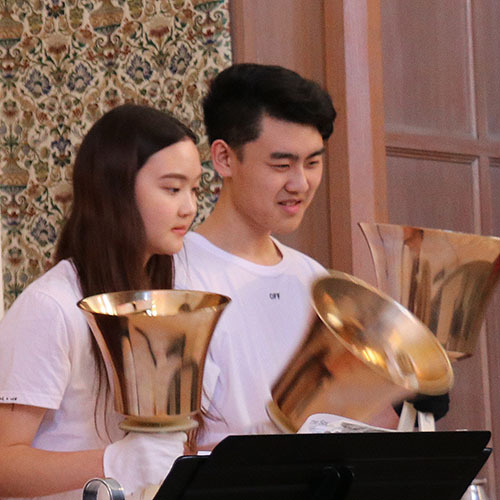 Trinity College School’s Johnson Ringers welcomed the warmer weather with a Spring Bells Concert the evening of Monday, April 9th in the Memorial Chapel. The concert included 18 ringers from the Senior School playing a range of popular music. Also featured was Grade 10 student Loretta Hu joining the ringers on piano for two selections. Special guest ringer was Ms. Shelagh Straughan, Senior School librarian and assistant housemaster of Wright House. An experienced ringer, Ms. Straughan joined her advisee, Grade 12 student Ben Traugott (who has rung for 12 years! ), and a select group of ringers for Beethoven’s difficult Moonlight Sonata. Thanks go to our audience, to bell captains Rachel Cheung and Amy Topshee, and to our musicians for their enthusiasm and dedication to the art of handbell ringing. View the Spring Bell Concert ’19 gallery for more photos.